Stars are luminous spheres of burning gas that are between 13 and 180,000 times the diameter (width) of the Earth. The Sun is the nearest star to Earth, and is 109 times its diameter. For an object to qualify as a star, it must be large enough for nuclear fusion to have been triggered in its core. 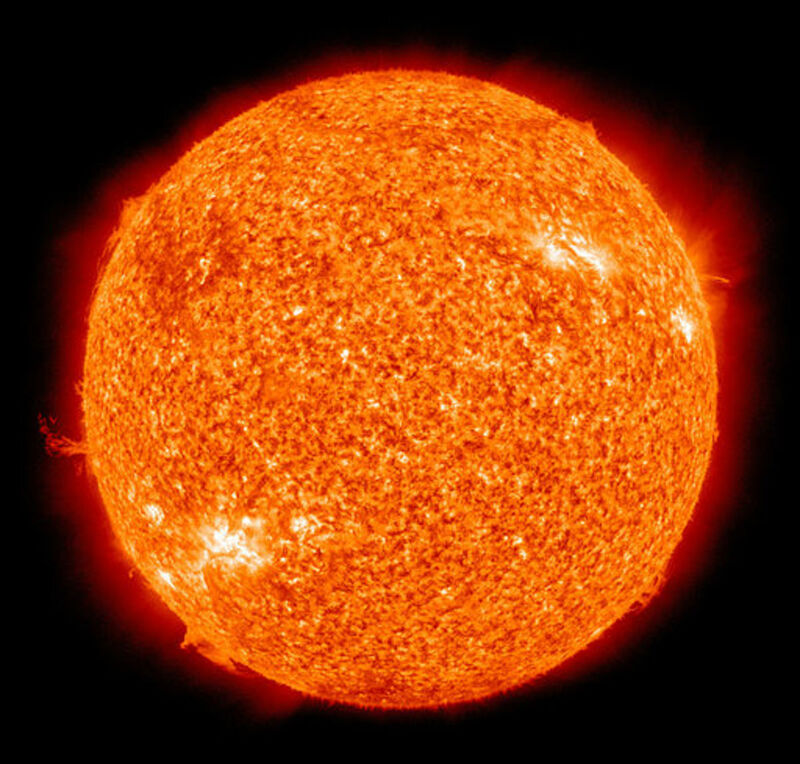 The surface temperature of the Sun is 5,500 °C, with a core temperature as high as 15 million °C. For other stars, the surface temperature can range from 3,000 to 50,000 °C. 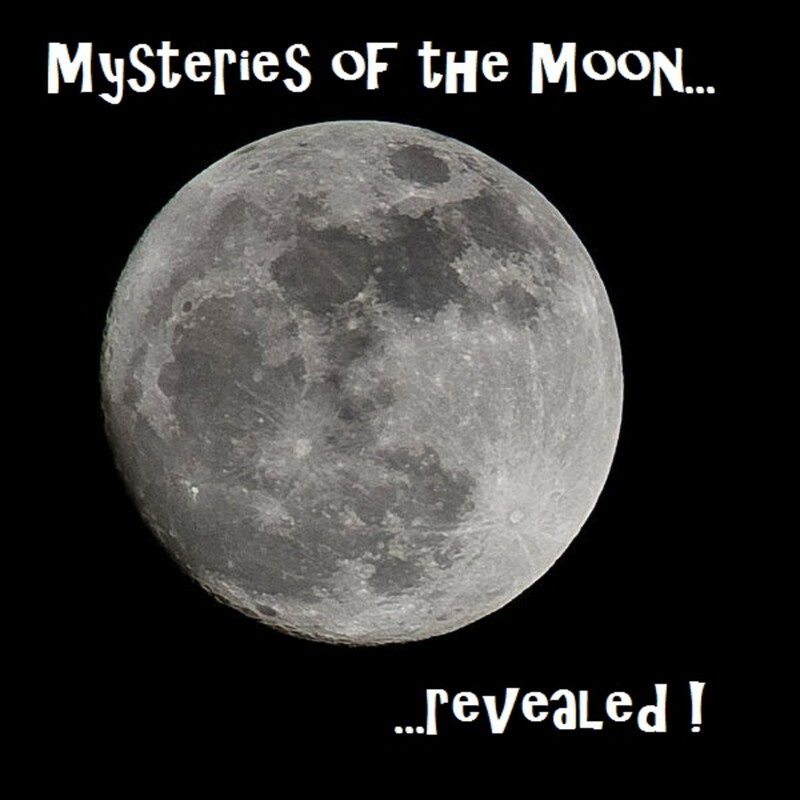 Stars are predominantly composed of hydrogen (71%) and helium (27%) gases, with traces of heavier elements such as oxygen, carbon, neon and iron. Some stars have lived since the earliest era of the universe, showing no signs of dying after more than 13 billion years of existence. Others live only a few million years before using up their fuel. Current observations show that stars can grow up to 300 times the mass of the Sun, and be 9 million times as luminous. 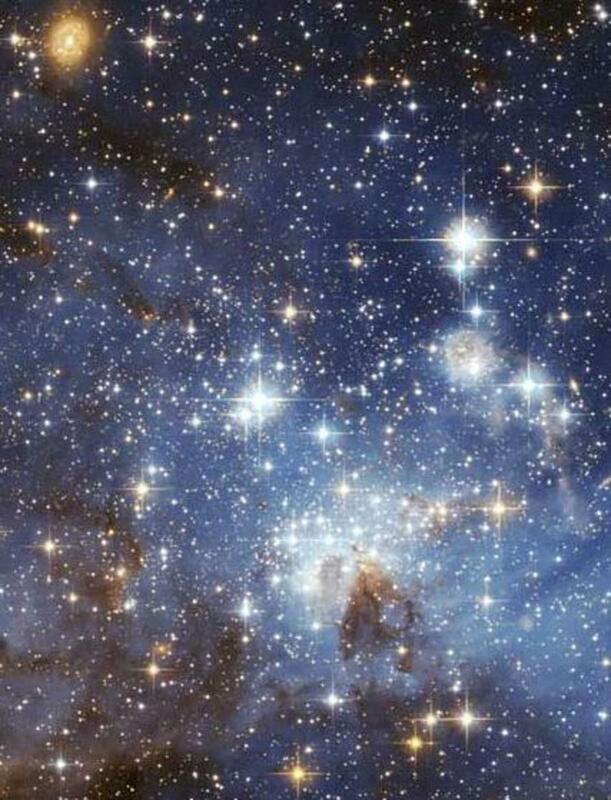 Conversely, the lightest stars can be 1/10th of the mass, and 1/10,000th the luminosity of the Sun. Without stars we would simply not exist. These cosmic behemoths convert basic elements into the building blocks for life. 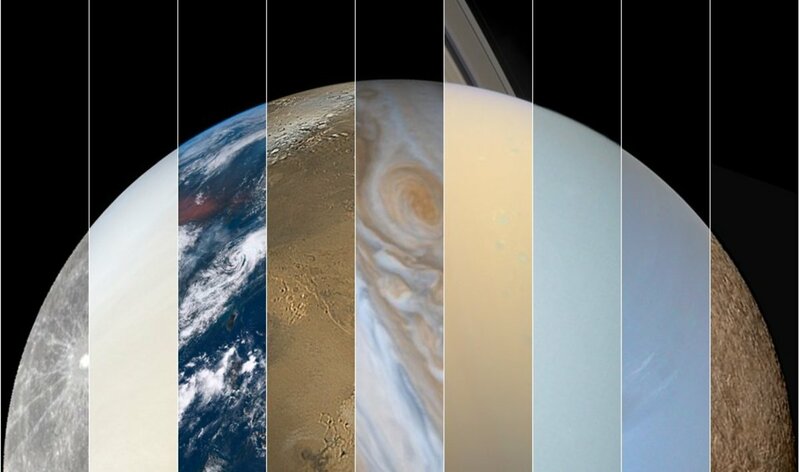 The next sections will describe the different stages in the life cycle of stars. Stars are born when nebulous clouds of hydrogen and helium gas coalesce under the force of gravity. Often a shock wave from a nearby supernova is required to produce areas of high density in the cloud. These dense pockets of gas contract further under gravity, while accumulating more material from the cloud. The contraction heats up the material, causing an outward pressure that slows the rate of gravitational contraction. This state of balance is called hydrostatic equilibrium. Contraction comes to a complete stop once the core of the protostar (young star) becomes hot enough for hydrogen to fuse together in a process called nuclear fusion. At this point, the protostar becomes a main sequence star. 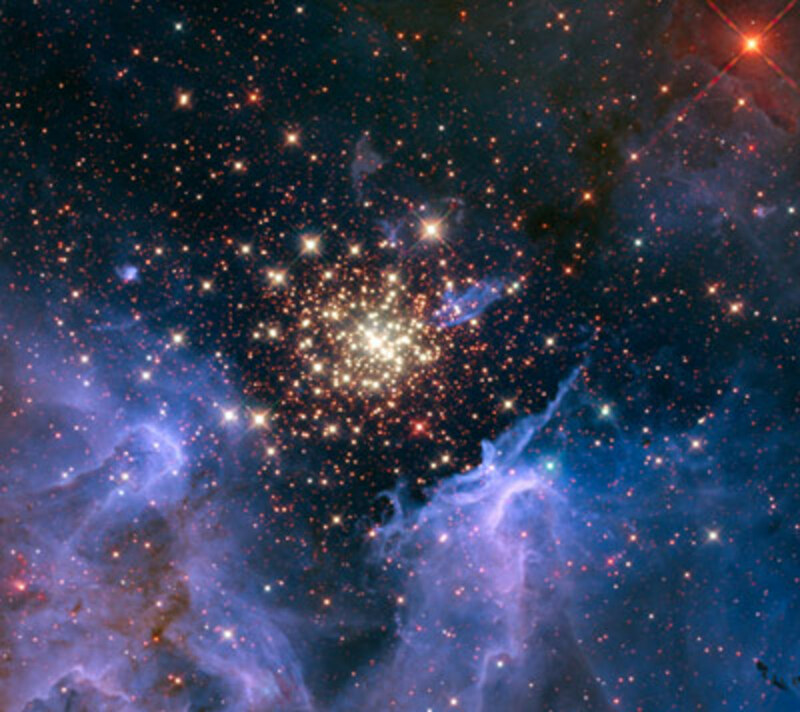 Star formation often occurs in gaseous nebulae, where the density of the nebula is great enough for hydrogen atoms to chemically bond to form molecular hydrogen. 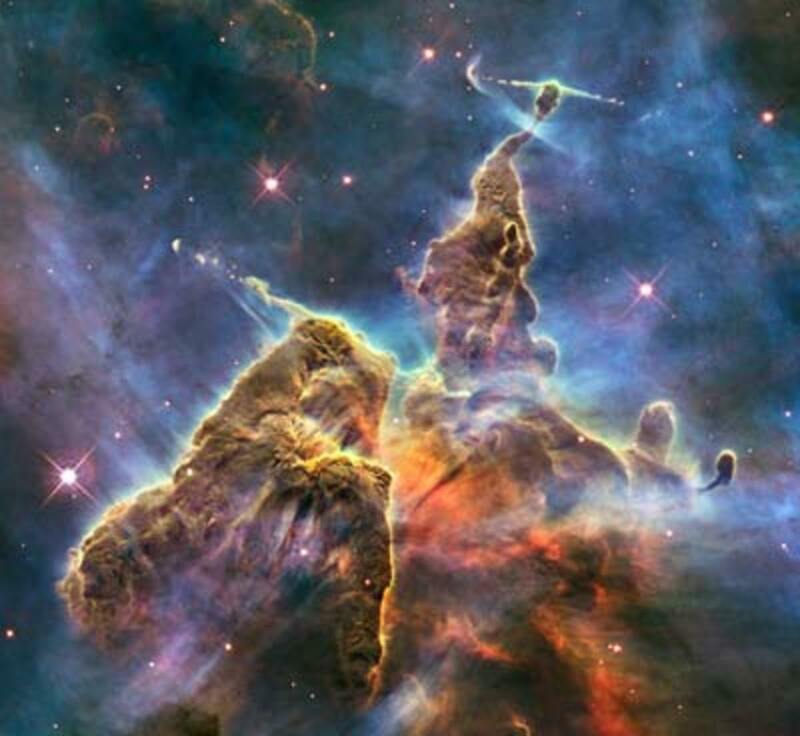 Nebulae are often called stellar nurseries because they contain enough material to produce several million stars, leading to the formation of star clusters. Hydrogen gas is predominantly burned in stars. It is the simplest form of atom, with one positively charged particle (a proton) orbited by a negatively charged electron, although the electron is lost due to the intense heat of the star. The stellar furnace causes the remaining protons (H) to slam into each other. At core temperatures above 4 million °C, they fuse together to form helium (4He), releasing their stored energy in a process called nuclear fusion (see right). During fusion, some of the protons are converted into neutral particles called neutrons in a process called radioactive decay (beta decay). 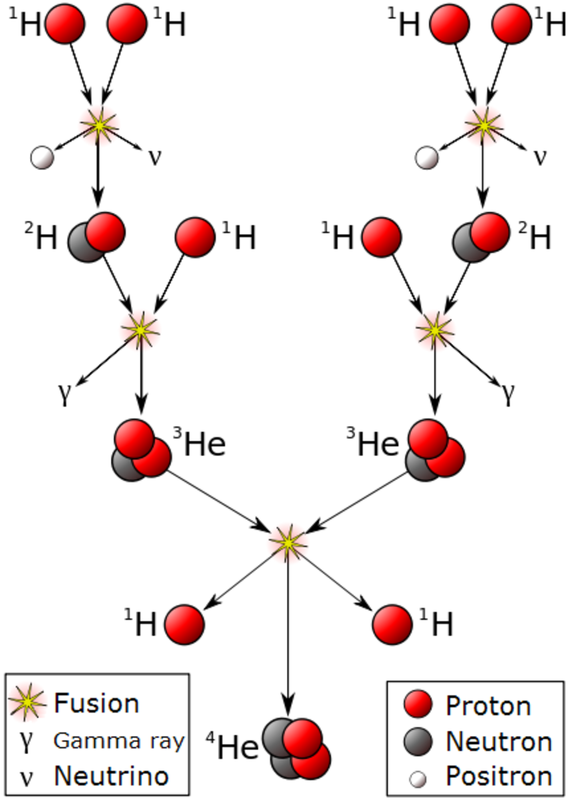 The energy released in fusion heats the star further, causing more protons to fuse. Nuclear fusion continues in this sustainable fashion for between a few million and several billion years (longer than the current age of the universe: 13.8 billion years). 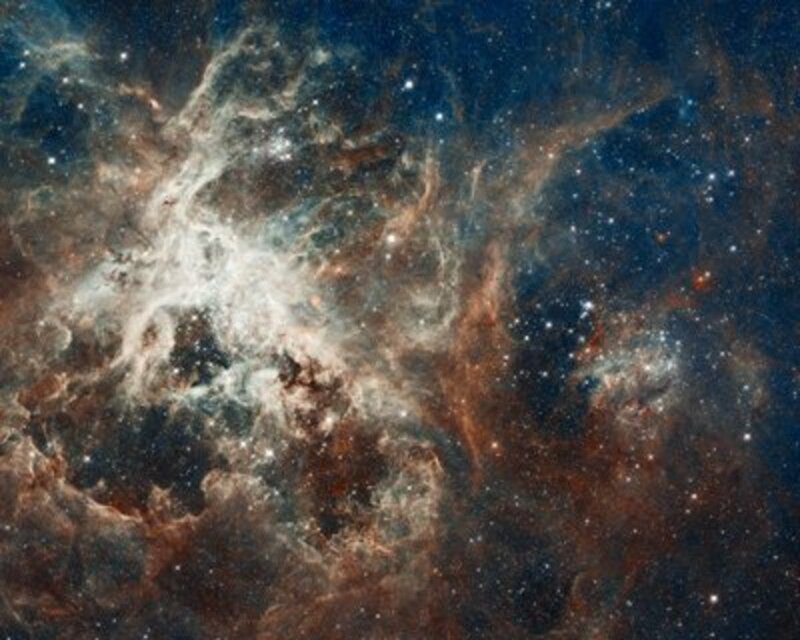 Contrary to expectations, the smallest stars, called red dwarfs, live the longest. Despite having more hydrogen fuel, large stars (giants, supergiants and hypergiants) burn through it quicker because the stellar core is hotter and under greater pressure from the weight of its outer layers. Smaller stars also make more efficient use of their fuel, as it is circulated throughout the volume via convective heat transport. If the star is large enough and hot enough (core temperature above 15 million °C), the helium produced in nuclear fusion reactions will also be fused together to form heavier elements such as carbon, oxygen, neon, and finally iron. Elements heavier than iron, such as lead, gold, and uranium, may be formed by the rapid absorption of neutrons, which then beta decay into protons. This is called the r-process for `rapid neutron capture', which is believed to occur in supernovae. Stars eventually run out of material to burn. This first occurs in the stellar core as this is the hottest and heaviest region. 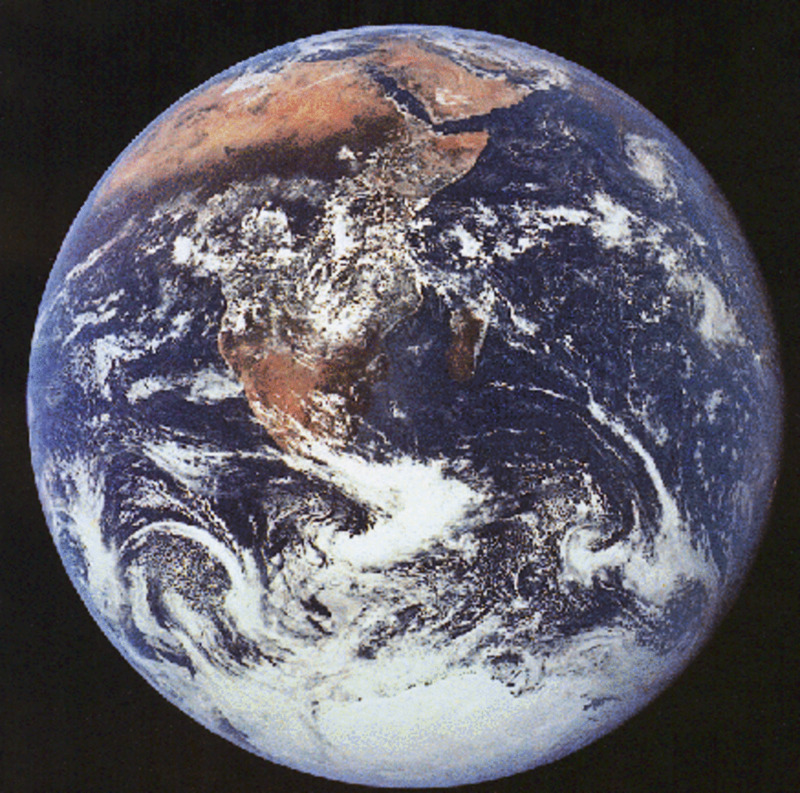 The core begins a gravitational collapse, creating extreme pressures and temperatures. The heat generated by the core triggers fusion in the outer layers of the star where hydrogen fuel still remains. As a result, these outer layers expand to dissipate the heat being generated, becoming large and highly luminous. This is called the red giant phase. Stars smaller than about 0.5 solar masses skip the red giant phase because they cannot become hot enough. The contraction of the stellar core eventually results in the expulsion of the outer layers of the star, forming a planetary nebula. The core stops contracting once the density reaches a point where stellar electrons are prevented from moving any closer together. This physical law is called Pauli's Exclusion Principle. The core remains in this electron degenerate state called a white dwarf, gradually cooling to become a black dwarf. Stars of more than 10 solar masses will typically undergo a more violent expulsion of the outer layers called a supernova. In these larger stars, the gravitational collapse will be such that greater densities are reached within the core. 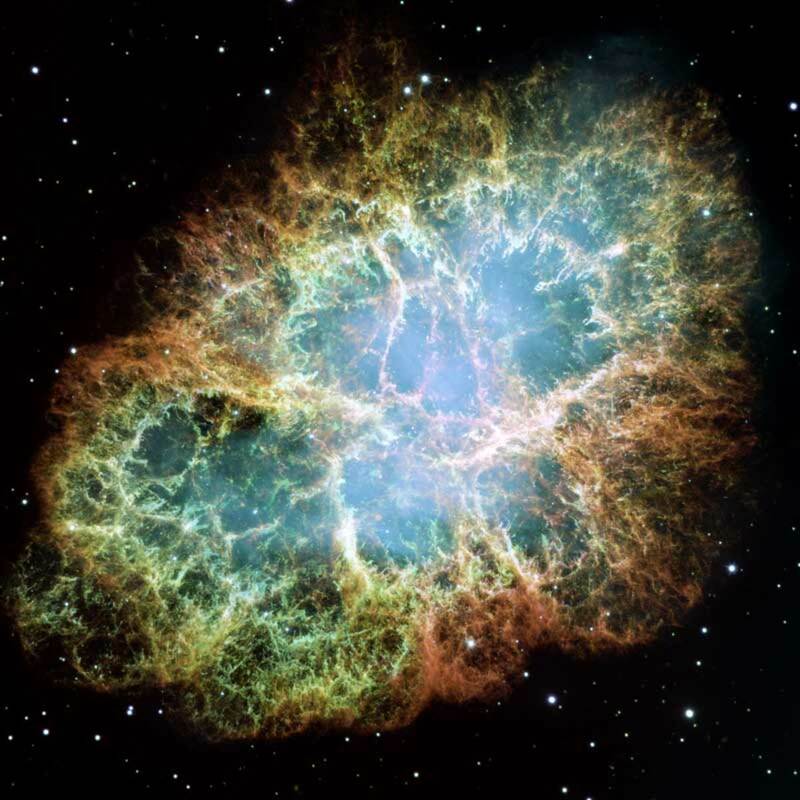 Densities high enough for protons and electrons to fuse together to form neutrons may be reached, releasing the energy sufficient for supernovae. The superdense neutron core left behind is called a neutron star. Massive stars in the region of 40 solar masses will become too dense for even a neutron star to survive, ending their lives as black holes. 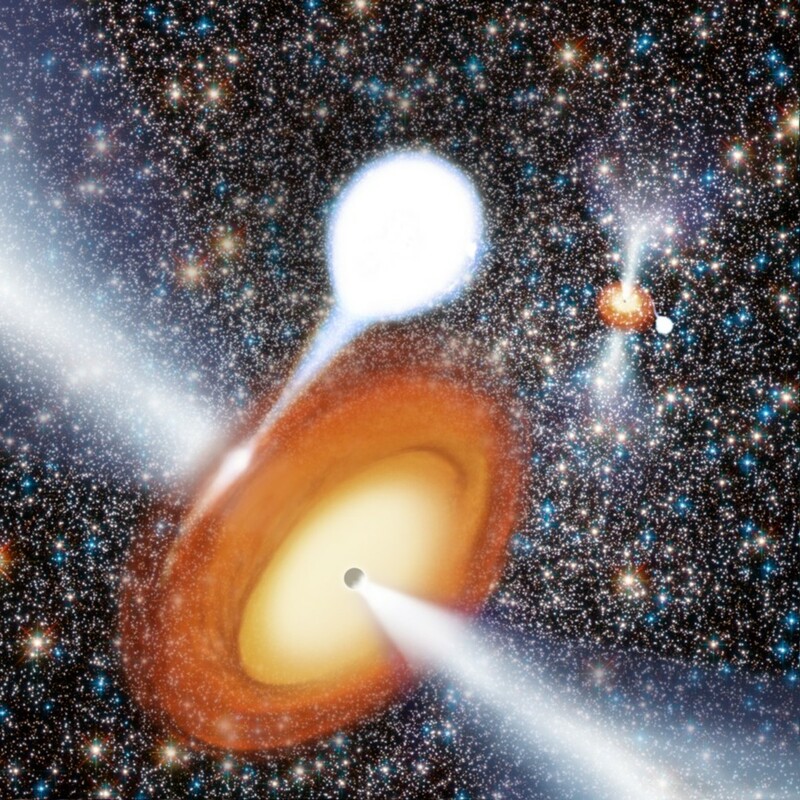 The expulsion of a star's matter returns it to the cosmos, providing fuel for the creation of new stars. 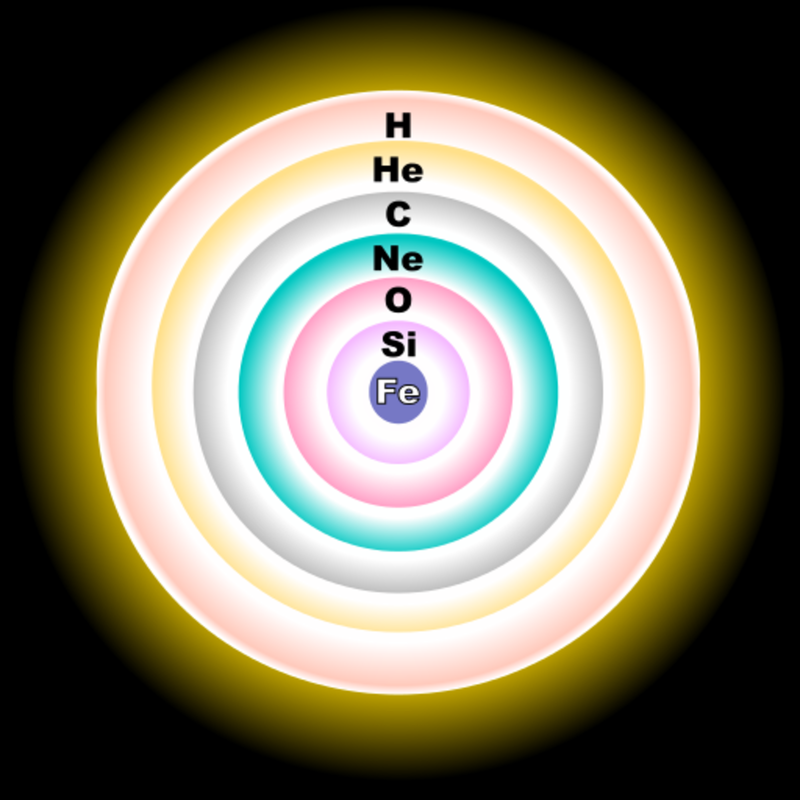 As larger stars contain heavier elements (e.g. carbon, oxygen and iron), supernovae seed the universe with the building blocks for Earth-like planets, and for living beings such as ourselves. The early evolution of the Sun from protostar to main sequence star. The evolution of heavier and lighter stars are compared. As stars progress through life, their size, luminosity and radial temperature change according to predictable natural processes. This section will describe those changes, focusing on the life cycle of the Sun. Prior to igniting fusion and becoming a main sequence star, a contracting protostar will reach hydrostatic equilibrium at around 3,500 °C. This particularly luminous state is proceeded by an evolutionary stage called the Hayashi track. As the protostar gained mass, the accumulation of material increased its opacity, preventing the escape of heat via light emission (radiation). 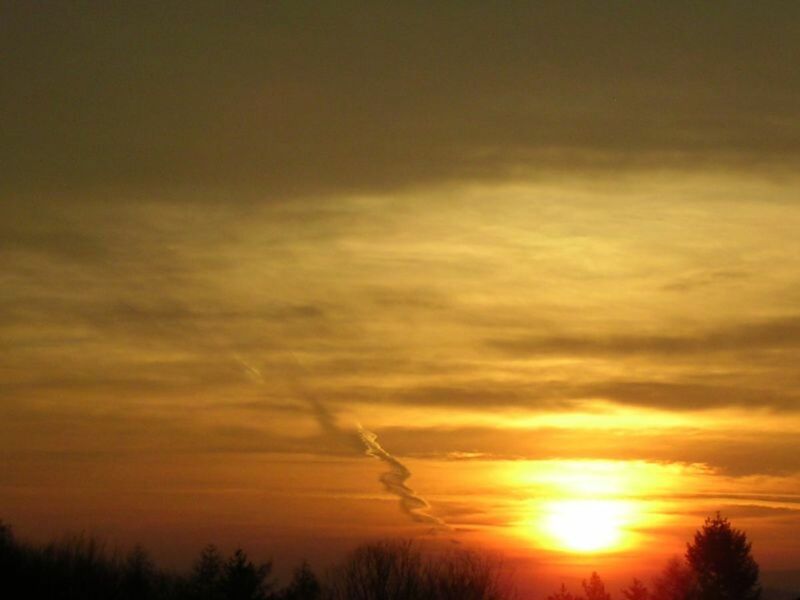 Without such emission, its luminosity begins to decrease. However, this cooling of the outer layers causes a steady contraction that heats up the core. To efficiently transfer this heat, the protostar becomes convective, i.e. hotter material moves towards the surface. If the protostar has accrued less than 0.5 solar masses, it will remain convective, and will stay on the Hayashi track for up to 100 million years before igniting hydrogen fusion and becoming a main sequence star. If a protostar has less than 0.08 solar masses, it will never reach the temperature required for nuclear fusion. 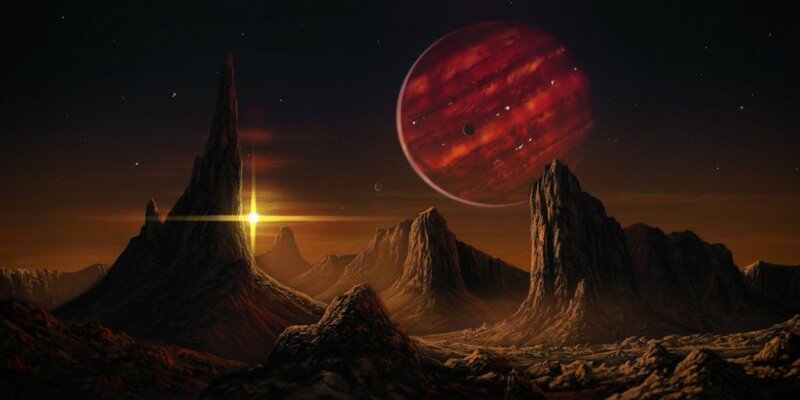 It will end life as a brown dwarf; a structure similar to, but larger than, Jupiter. 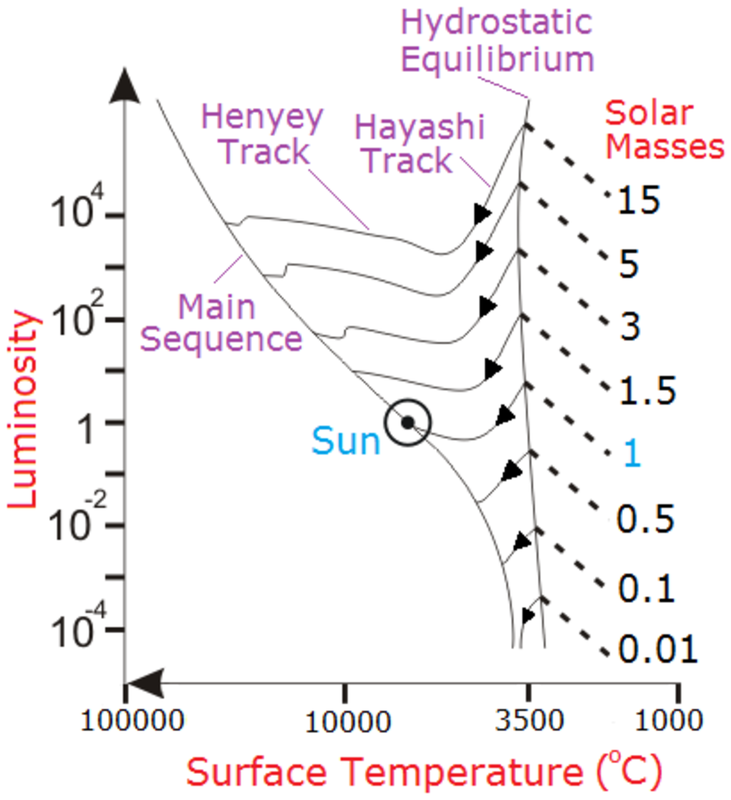 However, protostars heavier than 0.5 solar masses will leave the Hayashi track after as little as a few thousand years to join the Henyey track. 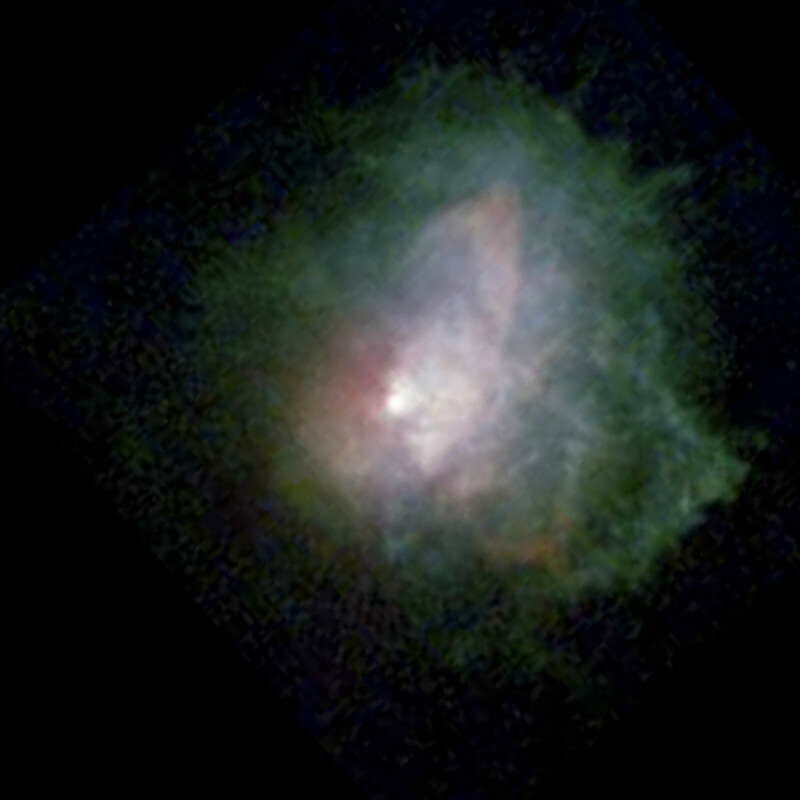 The cores of these heavier protostars become hot enough for their opacity to decrease, prompting a return to radiative heat transfer, and a steady increase in luminosity. Consequently, the surface temperature of the protostar drastically increases as heat is effectively transported away from the core, prolonging its inability to ignite fusion. However, this also increases the core density, producing further contraction and subsequent heat generation. Eventually the heat reaches the level required to commence nuclear fusion. Like the Hayashi track, protostars remain on the Henyey track for a few thousand to 100 million years, though heavier protostars remain on the track longer. Once hydrogen fusion begins, all stars enter the main sequence at a position dependent on their mass. 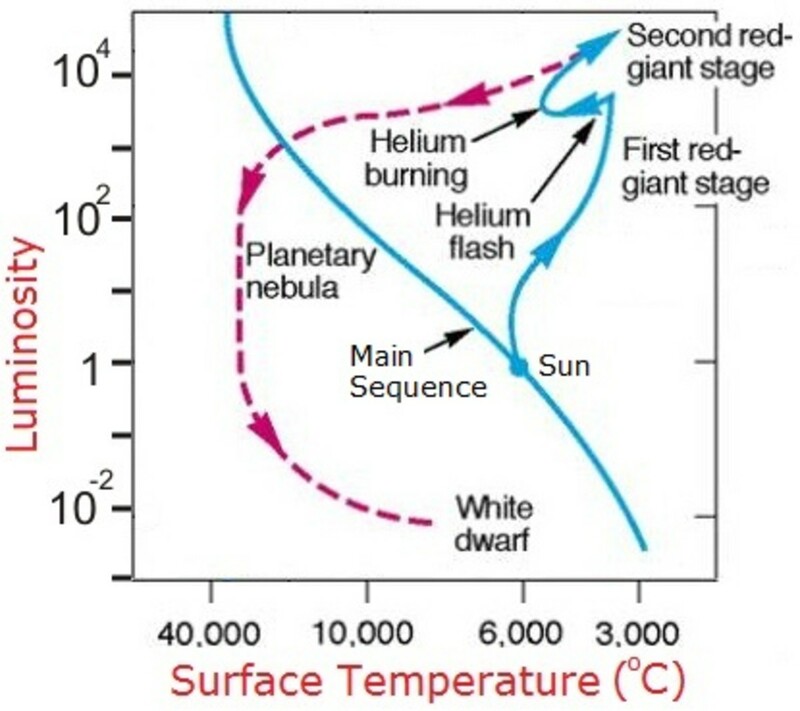 The largest stars enter at the top left of the Hertzsprung Russell diagram (see right), while smaller red dwarfs enter at bottom right. During their time on the main sequence, stars larger than the Sun will become hot enough to fuse helium. The inside of the star will form rings like a tree; with hydrogen being the outer ring, then helium, then increasingly heavier elements towards the core (up to iron) depending on the size of the star. These large stars remain on the main sequence for only a few million years, while the smallest stars remain for perhaps trillions. The Sun will remain for 10 billion years (its current age is 4.5 billion). When stars between 0.5 and 10 solar masses begin to run out of fuel, they leave the main sequence, becoming red giants. Stars larger than 10 solar masses typically destroy themselves in supernova explosions before the red giant phase can fully proceed. 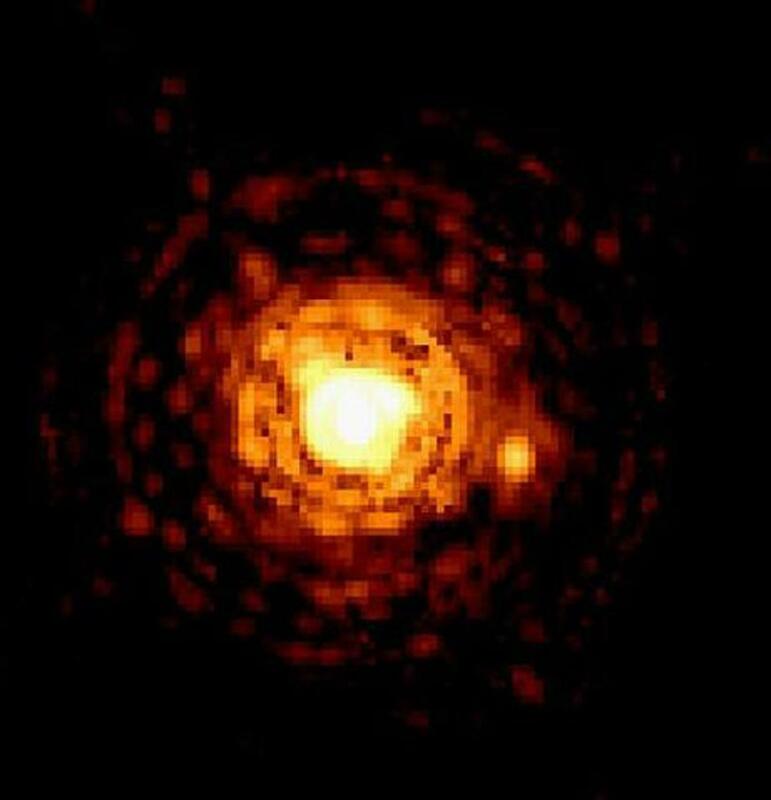 As previously described, red giant stars become particularly luminous due to their increased size and heat generation following the gravitational contraction of their cores. However, as their surface area is now much larger, their surface temperature decreases substantially. They move towards the top right of the Hertzsprung Russell diagram. As the core continues to contract towards a white dwarf state, the temperature may become high enough for helium fusion to take place in the surrounding layers. This produces a `helium flash' from the sudden release of energy, heating the core and causing it to expand. The star briefly reverses its red giant phase as a result. However, the helium surrounding the core is quickly burnt, causing the star to resume the red giant phase. Once all possible fuel is burnt, the core contracts to its maximum point, becoming super hot in the process. Cores of less than 1.4 solar masses become white dwarfs, which slowly cool to become black dwarfs. 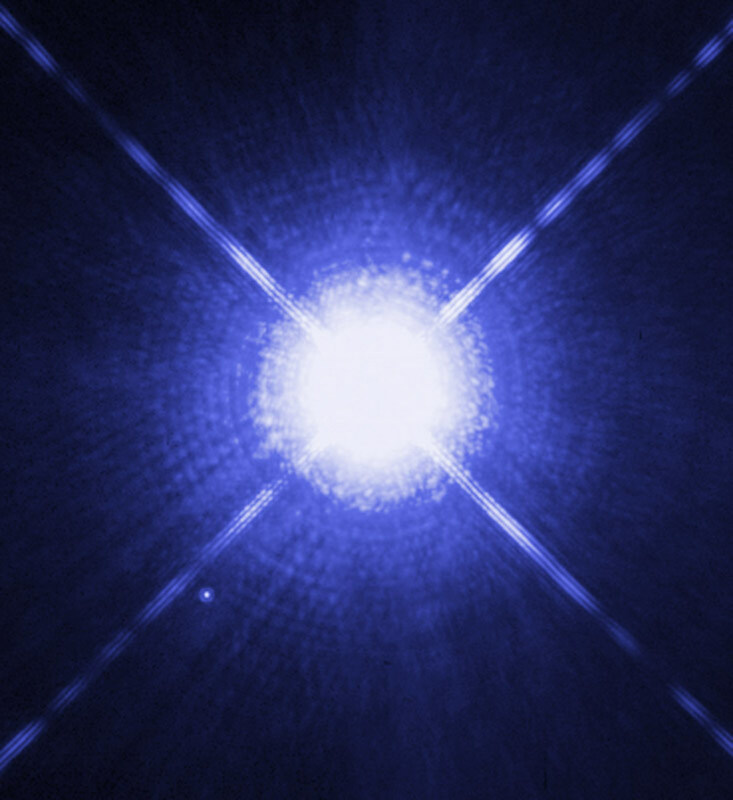 When the Sun becomes a white dwarf, it will have about 60% of its mass and be compressed to the size of the Earth. Cores heavier than 1.4 solar masses (Chandrasekhar limit) will be compressed into 20 km wide neutron stars, and cores greater than approximately 2.5 solar masses (TOV limit) will become black holes. It is possible for these objects to subsequently absorb enough matter to exceed these limits, prompting a transition to either a neutron star or a black hole. 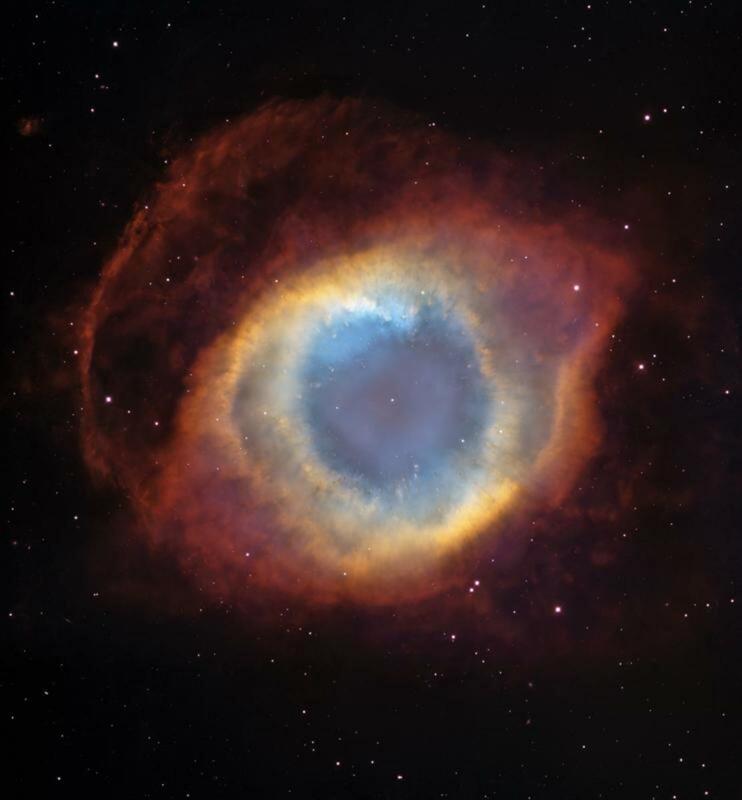 In all cases the outer layers are completely expelled, forming planetary nebulae in the case of white dwarfs, and supernovae for neutron stars and black holes. 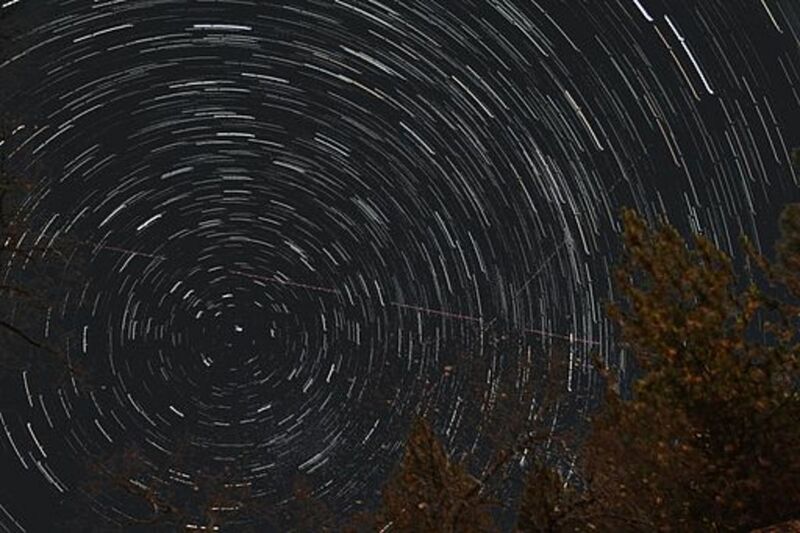 What's so Special About the North Star (Polaris)? Simply loved this hub. This hub is very well researched and contains great information. I have always been interested in stars and its evolution. Congratulations for being selected HOTD! This was both readable and interesting, Thomas. And I'm really glad to see that a hub that provides serious information on a scientific subject can be selected as HOTD. Congratulations! Thanks, glad you liked it. I've done likewise with a link in my "more information" section. I liked you Hub so I linked it to my Hub "Solar Flares and Their Impact on the Earth". Keep up the good work.